The Marshalltown Convention & Visitors Bureau (MCVB) has been in operation since 1991. The MCVB is operational through the funding received from a percentage of the Motel/Hotel tax. 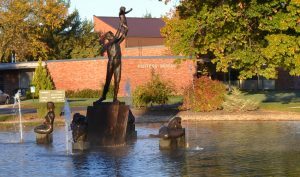 Their office is located in the Fisher Community Center which was generously donated to the community by William (Bill) Fisher and is the location of Christian Petersen’s final sculpture, “Dedication to the Future”. Marshalltown is the ideal location offering a convenient drive from all four corners of the state. The MCVB assists groups planning meetings, conventions, tournaments and events hosted in Marshalltown and Marshall County. They can help find the perfect venue. They also serve as the contact for group tour planners; showcasing Marshalltown as a destination for tours. See the Planners web page for more information. Visitors and the community can find Events online. The MCVB manages a web page that is considered the hub for Marshalltown and Marshall County events. Events are added daily by community members, organizations and businesses offering events open to the public. View the digital pages of the Marshalltown Menu, A Guide to Local Eateries. 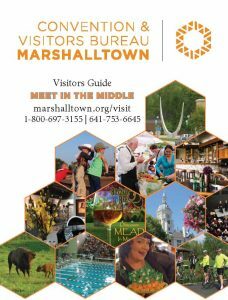 Stop by the MCVB office for a Marshalltown Visitors Guide, map and other brochures about Marshalltown and the area. The visitor guide replicates most of the information that is found on their website. No matter your interest, Marshalltown has something for everyone. View the MCVB 2017-2018 Strategic Plan.